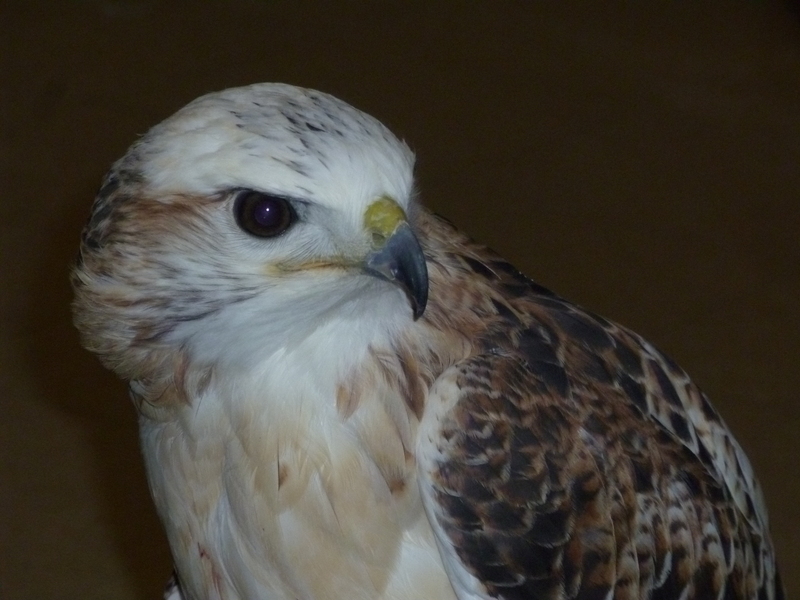 Casper’s story began when a hatch-year red-tailed hawk was found unable to fly in Itasca, Minnesota, in October 1992. He was brought to The Raptor Center clinic with respiratory difficulty, a broken right wing, and dislocated right shoulder. Bony buildup near the fracture site indicated an old fracture as well. He was put into rehabilitation for 32 weeks, where it became apparent his injuries caused permanent disability. The Raptor Center’s education department was able to give Casper the opportunity to become part of its diverse staff of education raptors, and on April 15, 1995, he was officially transferred into our program. “Casper” is named after the main character in the animated cartoon “Casper the Friendly Ghost,” a reference to this red-tailed hawk’s light feather coloration. Casper is a Krider’s morph, a subspecies Buteo jamaicensis kriderii. Individuals within this subspecies have notably lighter colored heads and chests and may lack markings on the lower breast.